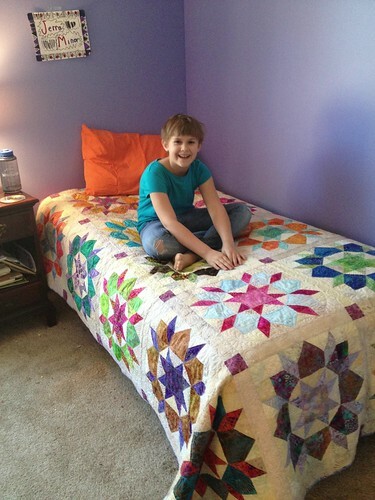 Today is Alice’s 9th birthday, so I thought it would be a good day to post about the making of her new bedquilt. 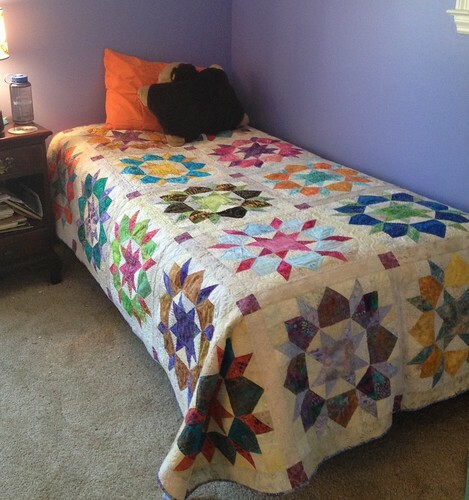 When I repainted her bedroom periwinkle a few years ago, her original quilt didn’t match as well. It still looked fine, but it didn’t look like it had been made for that room, if that makes any sense. I saw Swoon blocks popping up all the time on Flickr, so I grabbed a piece of graph paper and drew out the block pattern. 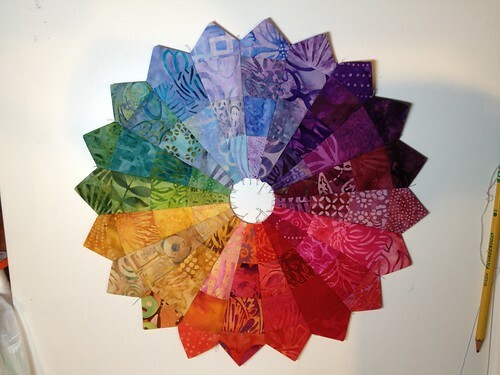 The pattern I linked to has 24″ finished blocks and uses fat quarters of fabric, but I wanted to be able to use my batik charm squares (I had probably close to 500 of those 5″ squares to choose from) and 2.5″ strips of natural fabric (I had most of two jelly rolls of natural batiks), so I had to resize the block to 16″ to use what I had. 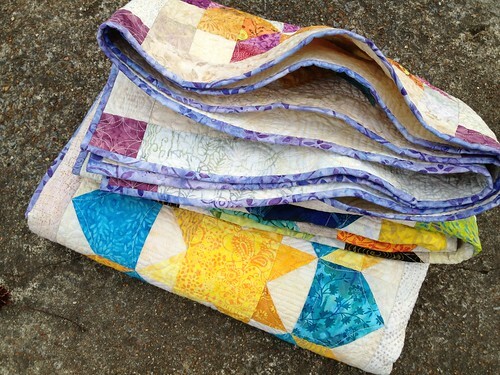 I really didn’t want to go out and purchase new stuff for this, partly because of the financial implications of doing that and partly because I’m discovering that I really like a scrappy look for my quilts. I scribbled out calculations and measurements on a scrap of envelope that stayed next to my sewing machine for a long time as I assembled all of the blocks. 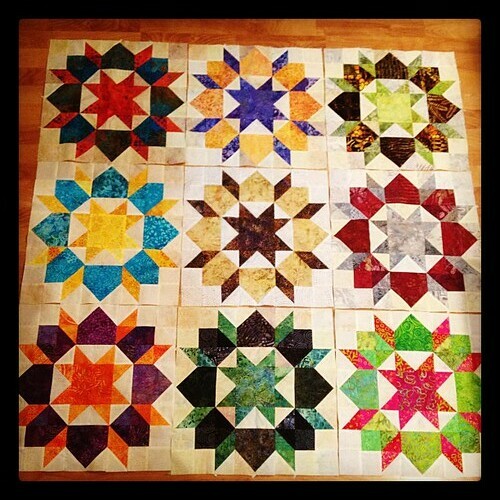 I wish I still had that scrap of paper because it was kind of cool how I did it, but I think I threw it out after the fire since the quilt top was totally assembled by then. Anyway… I figured out that I needed 2 different contrasting colors for the blocks themselves (8 charms of one color and 7 of the other to get the full block), plus the 2.5″ strips of natural batiks. 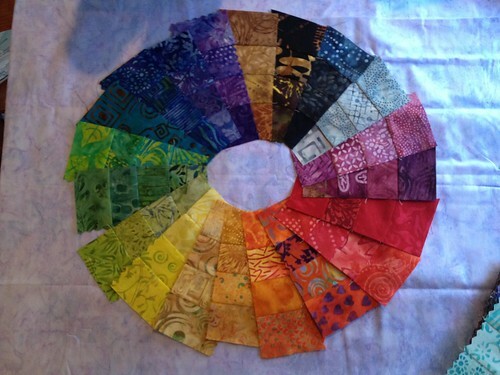 I went through my batik charms stash and sorted them all by color. Then I found groupings of 8 and 7 of the same color and value that could work together in a single block. 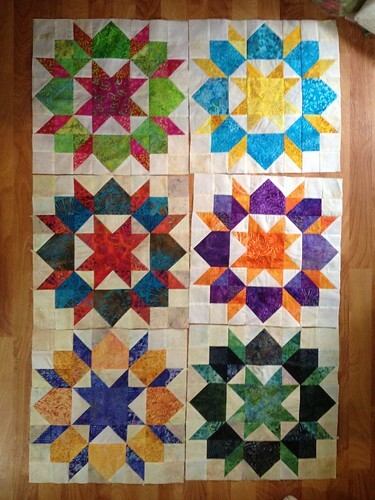 I paired the groupings to get a good balance of colors, and started cutting them and prepping the blocks. 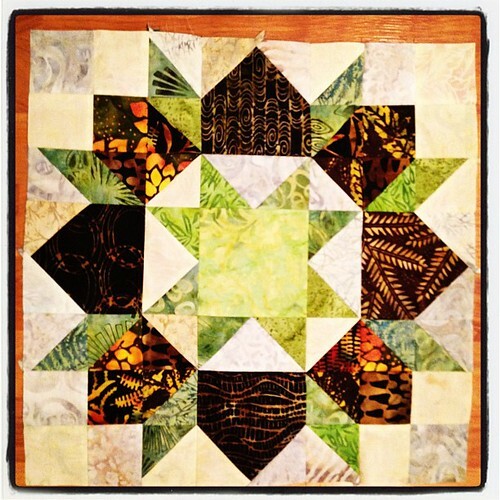 I made a few blocks to see if I liked them done scrappy, and I did! 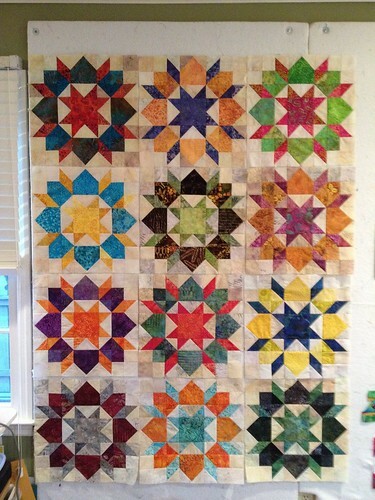 Each block has 81 pieces of fabric in it after I cut all of the required elements. So I kept going. At this point I wasn’t making the quilt for Alice yet, but as it grew she got attached to it and wanted it for her room, especially after I made a periwinkle block. Occasionally I would make a block with really bizarre color combinations, just to see how it would come out. This one ultimately ended up being my absolute favorite block in the quilt, so I put it in the center so that it will show no matter how she makes her bed. 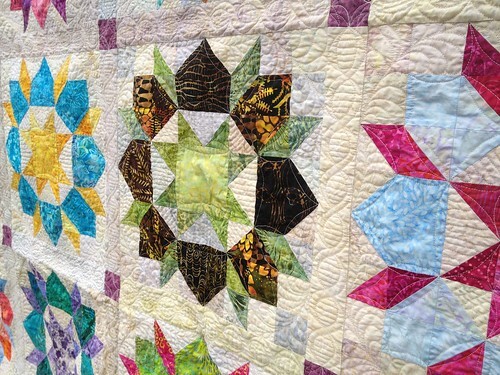 I will definitely explore more quilts with this color combination — very striking. 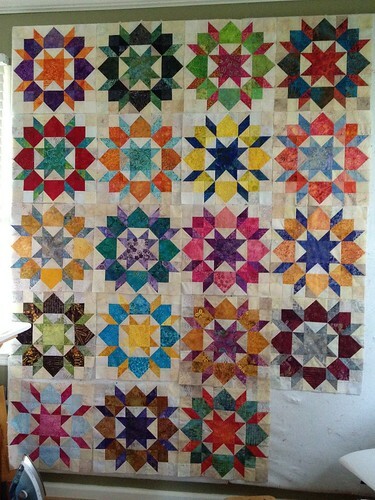 And the more blocks I made the more obsessed with this quilt I got. I couldn’t stop! Luckily I wasn’t finished watching the first two seasons of Downton yet, so I had plenty of TV to entertain me while I cut and cut and cut and pinned and pinned and pinned and pressed and pressed and pressed… The blocks are really cool, but I won’t lie: they’re quite tedious to make. 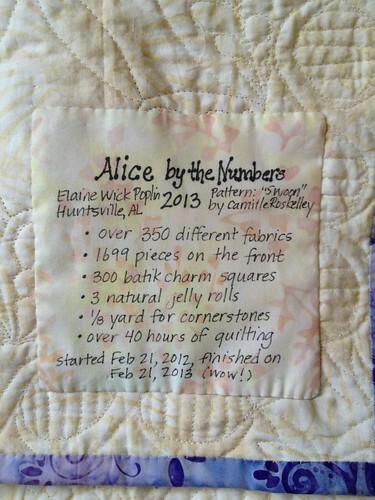 I ended up making a total of 23 blocks so I’d be able to choose the best ones for Alice’s room that would give the best balance to the quilt. 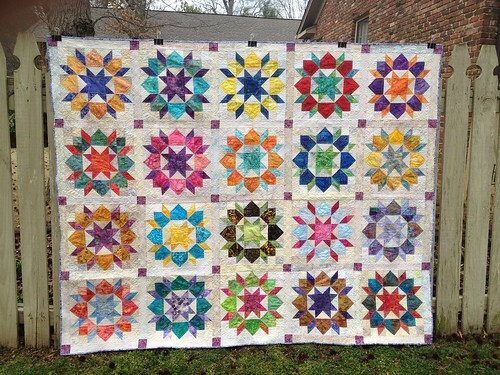 I’m very glad I did that, rather than forcing the red and gray one to be in it, and another green and black one… And I had one more that was kind of a repeat of one I had already made and I didn’t notice until it was done, so it was also eliminated from the final quilt. 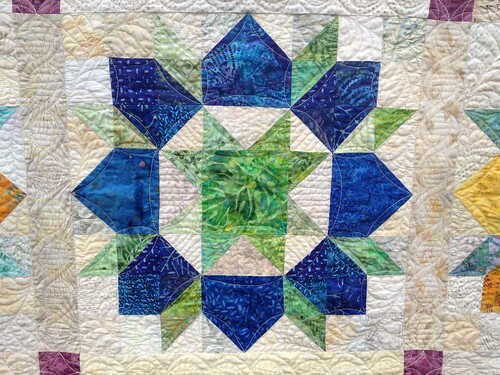 There are 1699 fabric pieces in the top, including all 20 blocks, all of the cornerstones, and all of the sashing pieces. Yes, I counted them. This is what I do to entertain myself when I’m machine quilting. My mind wanders, and usually goes to math. It’s a sickness. The above photo was taken on March 10, 2012. 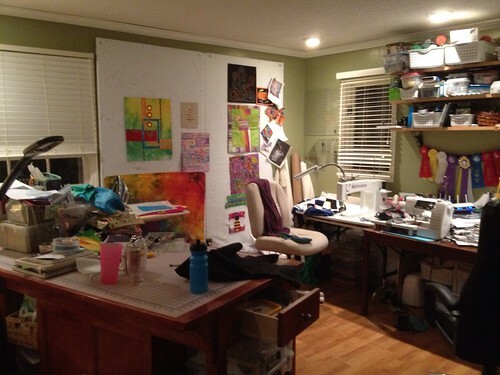 This photo was taken a month before, while I was working on the Swoon quilt, but other things were on the design wall at the time. The TV was at the other end of the room, so if I was standing at the cutting table or ironing, I could see it. 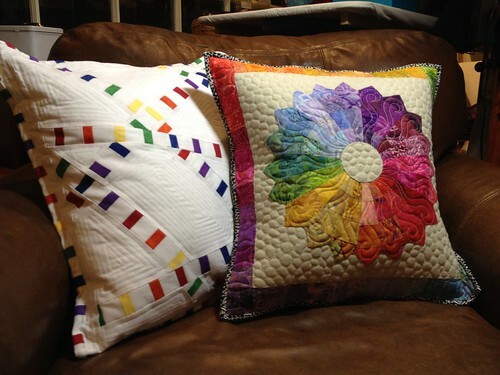 I’d pause Downton, go chain piece, and then stand up and watch until I was prepped and ready to sew again. 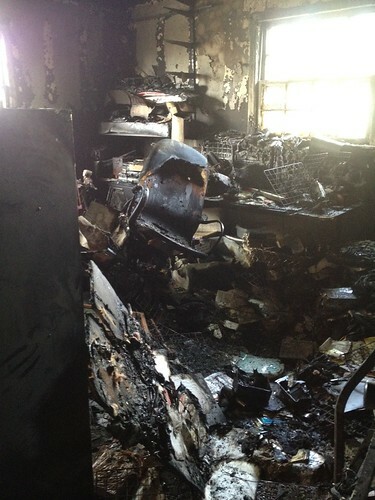 It was on the design wall when the house filled with smoke. I carefully pulled it down, and my friend Claire washed it for me in her bathtub and laid it out on her back patio, smoothing the seams as much as possible. 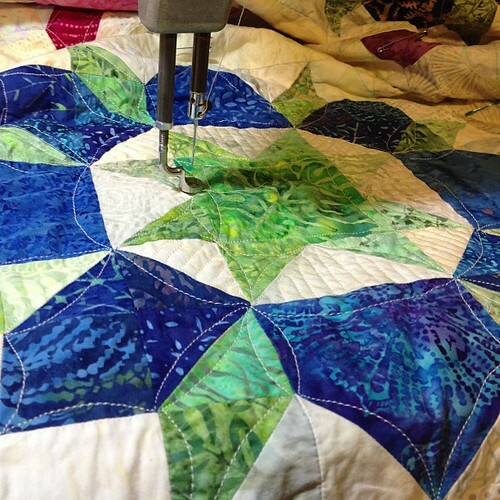 When I was ready to face it again, in late summer of last year, I re-pressed all gazillion seams and starched it smooth again, so that I could layer it and prepare it for quilting. Those photos were taken August 13 of last year in the rental house, about 5 weeks before Emily died of kidney failure. I have a audionote of her talking to me that night that I’ll treasure. I knew we were nearing the end with her because she was starting to get obsessed with water. 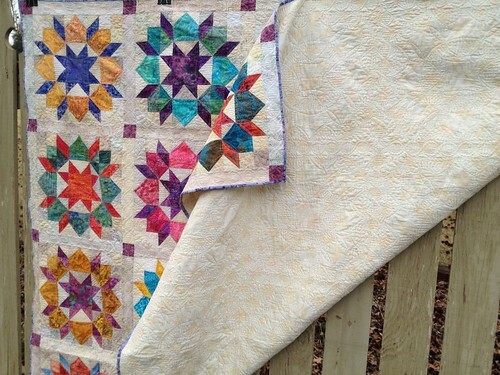 I quilted the swoon blocks simply, and then had a blast in the negative space. I got a lot better at feathers in odd spaces, and I figured out how to quilt a double helix! And then I finished it! Binding took a while… it’s big. 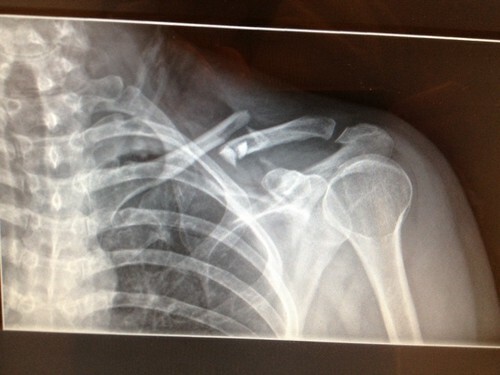 And I had a lot of interference. 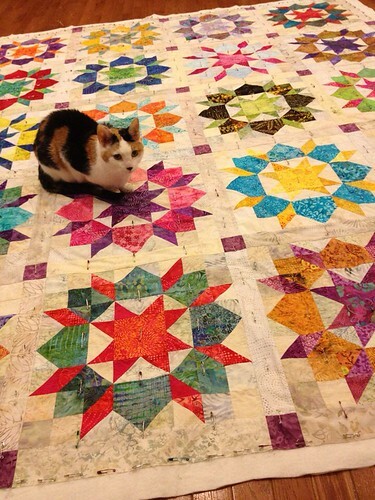 It took around 40 hours to machine quilt the whole thing. 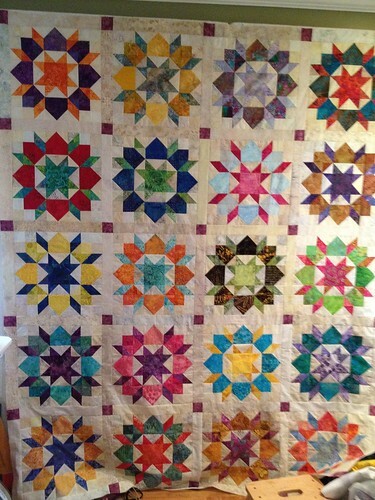 I’m very glad I took my time and waited until I was truly ready to quilt this one, rather than rushing it to get it done. 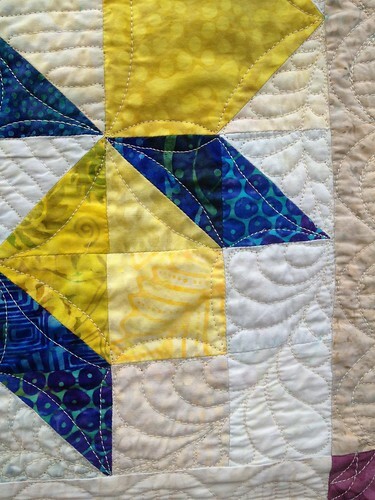 I’m finding a lot of pleasure in custom quilting my quilts these days, so it’s hugely satisfying when I finish one. 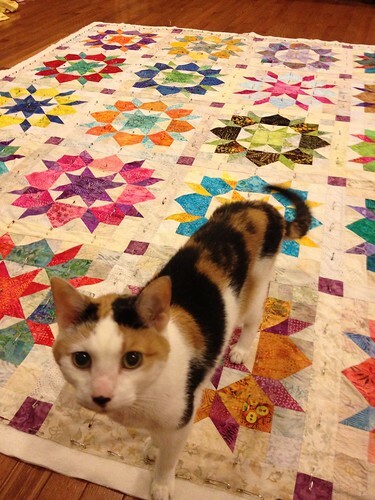 I’m hoping she’ll let me borrow it to enter it in the local quilt show this fall. She may not. We shall see. She made this video from clips while I drove Alice to camp. 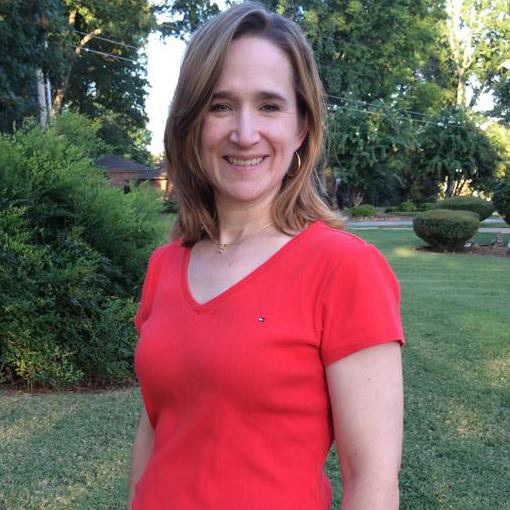 Helen’s entire life is a quest for Mountaintop Experiences. Every day this summer she has asked me “What exciting is going to happen today?” Most days the exciting thing has already happened — art class, drama class… I was a Good Mother this summer and signed them up for a bunch of stuff and I am SO very glad I did, even if it means I’m driving around dropping off/picking up and/or hiring babysitters to do that for me so I can tutor. Well, today, I didn’t really have an answer. Then I realized that I needed to go back to Bridge Street to return/exchange a Fossil purse I bought on Sunday, because some of the stitching was coming undone. I *love* the purse, even if it’s a bit larger than I’ve grown accustomed to carrying, but the stitching was coming undone in the center front. Um, no. It needed to be replaced. So I told the girls that we were going to go to Bridge Street. “CAN WE GO TO JUSTICE? !” squealed Helen. Oh, man. Yeah, we’re THAT age. Yippee. I asked her if she had any money, knowing full well that she hoards money just like she hoards everything else, and I know she has a stash of close to $100 now in her room. Including the $10 I gave her TWO SUMMERS AGO to go underwater, which she still had not spent. I’m not kidding. Hoarder. Watch for her on TLC. Seriously. Helen wasn’t too keen on the idea of spending her own money until I pointed out that “Mommy doesn’t really get a say in what you spend your own money on” — within reason. I did tell her no makeup other than lip gloss, and I could argue with choices if I really felt strongly but I couldn’t tell her what those might be ahead of time. She agreed, and went down and got $5. Alice, wanting to play along, was VERY upset that she didn’t have a stash of money. Oh, but she does. I have a piggy bank near the laundry room, and every time I find change in the laundry it goes in that piggy bank. And that piggy bank is Alice’s. So Alice has been hoarding change for almost 6 years now. We usually check our pockets so there wasn’t all that much in there, but she was able to scrape together $5 in quarters. Off we went. I returned the purse without an issue — they didn’t even make me present a receipt! The girl who sold me the purse remembered me, and she went to the back and got a brand new one and checked it over completely before handing it to me to make sure it was perfect this time. Very happy. I love Fossil purses. This is my third one, and it’s orange. LOVE it. It’s still really small, but my camera can actually fit in it without bulging and I could probably get a checkbook in there, too. What I’ve been carrying since knee surgery two years ago has been TINY. So it feels like I’m carrying around a Mary Poppins bag. Alice REALLY wanted to go to the Apple store. Her absolute favorite favorite favorite store EVER is the Apple store. She is a perfect angel (no, seriously!! she is!) in the Apple Store. I suggested we go to Justice first since we were almost there anyway, and THEN we’d go to the Apple store. Once in Justice (40% off on everything in the store! woohoo! ), Alice looked around a little bit and settled almost immediately on a Ty Penguin toy for $7.90. With tax, it put her just over $5 but I was willing to front them for slight overages. Alice went to the counter and paid for her penguin and was very happy. I told her what the upper limit of what she could afford was, and I swear she found everything in the store that was under that amount. After 20 minutes I finally told her she needed to come to a decision. She settled on two tubes of lip gloss. I don’t have a problem with lip gloss because it’s sheer and she eats it off within 5 minutes. Whatever. I realized she was going to be WAY under the $5 with that, so I grabbed another lip gloss and her total was $4.86. I could learn a lot by shopping with Helen. I don’t typically have the time or interest to browse like she did, but she really knew that what she wanted most in the store was what she ended up taking home with her. And she was SO pleased with her purchase. So much of the time I get in, get the item, get out, and get on with life, rather than savoring the experience. Today, as minor as it was for me, will probably be one of those memories she holds onto for a while, you know? It was the very first time she spent her own money without (much) censorship from Mom. And that’s pretty awesome. I think I should take my kids shopping like that more often. Truly, I don’t know why I waited this long. 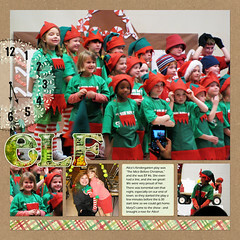 Here’s a page I did last night of the Christmas Play that they did at Alice’s school in December. She had a line! You can click on the photo to see the credits for all of the digital products used. The girls have started complaining that they don’t have a 2009 scrapbook to look at yet… I’ve been hoarding all of the layouts on my External Hard Drive and will have them printed in a single book, I think… But that means I need to finish the year. So. 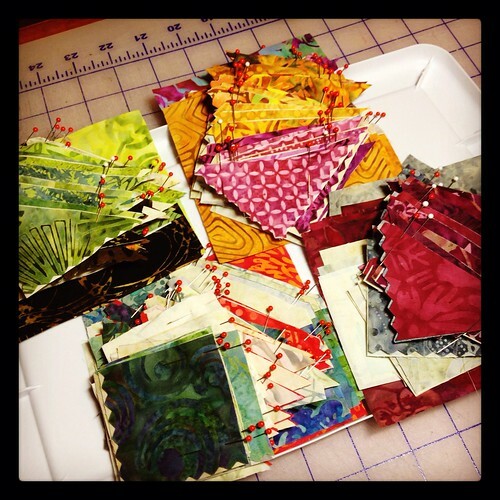 I’ll still be quilting a lot, but I plan to digiscrap a lot too in the coming weeks, to try to get that done. I have most of the year finished through September, except for Helen’s birthday and birthday party and Sweeney Todd, which were all in June… So I’ll need to get those done. And then October – December. Not too shabby; I should be able to finish before too much longer. And then hopefully Shutterfly will have a sale and I can get a decent price on having the book printed.